The combination of outstanding grip, thermal lining and good mechanical resistance makes the Portwest Thermal Orange and Blue Grip Gloves A145OB ideal for protection in cold settings. Moreover, the highly comfortable, breathable design prevents your hands from becoming too warm, making them ideal for long work. 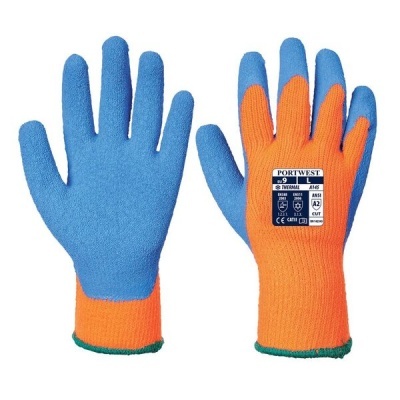 The Portwest Orange and Blue Gloves A145OB are available in four sizes, one of which should suit the hands of most users. Please measure the circumference of your hand around the knuckles (excluding the thumb) with your hand open and your fingers together, and the length of your hand from the tip of your middle finger to your wrist.